This ready-to-print rehearsal sign-in sheet makes it easy for stage managers to implement and practice sign-ins by cast and crew at all rehearsals, even on smaller productions. Not only does this sheet provide a documented history of rehearsals for stage manager and director review post-production, but it also holds the cast members accountable with one another for showing up on time. 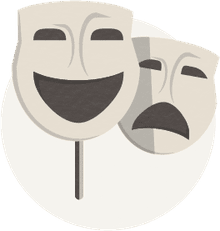 Completed forms should be kept together in a binder or folder so that the stage manager can report back to the director and producer on castmember attendance. After the show wraps, the forms should be archived, which will especially be useful for making future casting decisions regarding punctuality and attendance. A performance sign-in sheet will allow you to register and archive attendance by cast and crew at all performances. Should a member of the cast and crew not attend or be late to a performance, the stage manager should immediately note it on this sheet, call the cast or crew member, then alert the understudy. For this reason, understudies are also important to note on this performance attendance sheet. In the event a cast member is missing, the stage manager can check this sheet for the director and let him or her know which understudies are available on site to step into the role. Archiving records of missed attendance at performances is even more important than doing the same for rehearsals. Cast and crew should never miss a performance, even if they are an understudy, and directors will value knowing if someone who auditions for their next shows has missed a performance with them in the past. A clear, easy and detailed rehearsal checklist form to help stage managers accomplish the tasks required for each run-through. Items on the checklist include both administrative tasks like unlocking the rehearsal space and checking in cast members but also hospitality objectives like setting up snacks and beverages for cast and crew. Ensuring that each item on this list is checked off will help stage managers achieve a fully productive rehearsal and leave the theater or rehearsal space clean and tidy for the next time. Forms like this performance checklist can help stage managers stay organized and focused during the tense period before the curtain rises, ensuring that everything is in the right place and the cast and crew have everything they need to put on a great show. Starting with arriving on site, this handy checklist provides a step-by-step process for stage managers to ensure they haven't missed a detail, large or small, of the productions' needs. After the curtains close, the checklist continues to list things that need to be done to ensure the theater is left ready for the next performance. This comprehensive cast and crew basic info form will provide you with all the necessary contact and basic medical information you'll need on your production's cast and crew members. Completed forms should all be stored in one folder or binder per production. Even if cast and crew members take part in numerous productions under your stage management, they should fill out a new basic info form each time they are cast or join the production crew for a new show. The stage manager should also compile a one-page document, called the call sheet, with just the name of the cast or crew member, his or her phone number and his or her role in the production. This call sheet should then be attached as the first page of the folder that contains all completed contact forms.